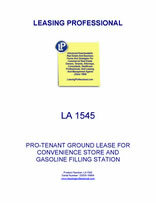 This lease is designed for a convenience store and/or a gasoliney filling station. It is very pro-tenant in tone. This Lease is made as of _________________, by and between COMMERCIAL PROPERTY LANDLORD, INC., a __________________ corporation ("Landlord"), and AGREEABLE CONVENIENCE STORE TENANT, INC., a _________________ corporation ("Tenant"). Landlord, in consideration of the covenants and agreements to be performed by Tenant and upon the terms and conditions hereinafter stated, does hereby lease, demise and let unto Tenant the land described on Exhibit A attached hereto ("Land"), all improvements, buildings, structures, equipment, pumps and tanks of Landlord, if any, situated on the Land (the "Improvements") and all rights, easements and appurtenances pertaining to the Land, including all parking and access rights relating thereto (collectively, the "Leased Premises"). The term of this Lease shall be for a period commencing on ____________ ("Commencement Date"), and ending on _____________________ ("Term"). Section 3.01. The Leased Premises shall be used for any lawful use, including, but not limited to, the operation of the Leased Premises as a convenience store and/or self-service gasoline station. Section 3.02. Tenant shall not perform any acts or carry on any practices which may injure the Leased Premises or constitute a nuisance, or use the Leased Premises for any business which is unlawful or in violation of any public or city ordinances. Section 4.01. Tenant, without offset or deduction, agrees to pay the Landlord at ___________________, or such other address as Landlord may designate, rent for the Leased Premises at the rate of_________________________ dollars ($______________) per month ("Monthly Rent") in advance on the first day of each and every calendar month during the Term of this Lease, the first such payment becoming due and payable on the Commencement Date. A prorated monthly rental installment shall be paid, if the Commencement Date is other than the first day of the month or if the term of the Lease terminates on a day other than the last day of the month. Section 4.02. All rental installments or payments (including any amounts payable as additional rent) more than ten (10) days past due shall subject Tenant to liability for payment of a late payment charge equal to five percent (5.0%) of each such late monthly installment or payment. Tenant acknowledges that Tenant has fully inspected the Leased Premises and on the basis of such inspection Tenant hereby accepts the Leased Premises "AS IS". Tenant acknowledges that the Improvements situated thereon, are suitable for the purposes for which the same are leased, in their present condition. Section 6.01. Alterations and Improvements. Tenant shall have the right to make alterations to or construct Improvements on the Leased Premises. Any alteration or improvement made to the Leased Premises shall be made in a workmanlike manner and in compliance with all valid laws, governmental orders and building ordinances and regulations pertaining thereto. Tenant shall promptly pay and discharge all costs, expenses, damages and other liabilities which may arise in connection with or by reason of any alterations, reconstruction, demolition or other work on the Leased Premises. All alterations, reconstruction, demolition or other work on the Leased Premises when completed shall be of such a nature as not to reduce or otherwise adversely affect the value of the Leased Premises. Tenant shall have the right to grant easements upon the estate of Landlord which are required for utilities or access in connection with Construction of the Improvements and Landlord agrees to execute all documents which Tenant may request in order to grant such easements. Section 6.02. Operating Expenses. Tenant agrees to pay any and all expenses of operation of the Leased Premises including, but not being limited to, electricity, water, gas and other utility services to persons and parties occupying the Leased Premises, it being the intention of this Lease that the amounts payable to Landlord hereunder as rent shall be absolutely net to Landlord, without diminution by reason of any expenses of operation of the Leased Premises. Section 6.03. Repairs; Compliance with Laws. Tenant shall keep all Improvements from time to time situated on the Leased Premises in a good repair and condition, and at the end or other expiration of the term of this Lease deliver up the Leased Premises and all Improvements thereon in good condition, reasonable wear and tear excepted (subject to Article XII hereof). Tenant shall at its sole cost and expense comply with all requirements of all municipal, state and federal authorities now in force or which may hereafter be in force, pertaining to the Leased Premises and shall faithfully observe in the use of the Leased Premises all municipal, state and federal laws and regulations now in force or which may hereafter be in force. Section 6.04. Release. Landlord hereby releases Tenant, and Tenant hereby releases Landlord, and their respective officers, agents, employees and servants, from any and all claims or demands for damages, loss, expense or injury to the Leased Premises, or to the furnishings and fixtures and equipment, or inventory or other property of either Landlord or Tenant in, about or upon the Leased Premises, as the case may be, which is caused by or result from perils, events or happenings which are the subject of insurance carried by the respective parties and in force at the time of any such loss; provided, however, that such waiver shall be effective only to the extent permitted by the insurance covering such loss and to the extent such insurance is not prejudiced thereby or the expense of such insurance is not thereby increased.